Karen Martin Reads: Post 18 A Little Bit of Jeeves and Wooster and Quite a Bit about the Henley Literary Festival! Post 18 A Little Bit of Jeeves and Wooster and Quite a Bit about the Henley Literary Festival! And a tiny bit of Jeeves and Wooster at that! 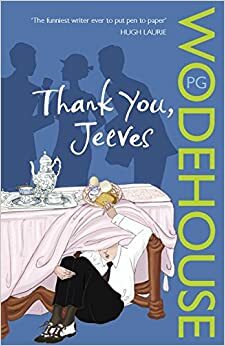 I have just completed Thank You Jeeves, my final compulsory read for my A Level students' coursework. I know Jeeves is fondly regarded as a English institution, and he was created as the landed gentry were beginning a steady decline towards World War 1 and subsequent radical social change, and yet I cannot get excited about the series. Yes, it is a light touch; candid humour that reveals relationship, but essentially, it is still dependent on slapstick. And I'm not a fan of slapstick! Even You've Been Framed makes me wince rather than giggle. So what of it? Jeeves finds himself in a series of scrapes whilst staying in Chuffnell Regis. He has moved out of the metropolis because his banjolele practice has been annoying fellow residents. But he finds himself at the mercy of American J Washburn Stoker, his daughter Pauline and their friend Sir Roderick Glossop. Because of the said banjolele, Jeeves has parted company with Wooster, leaving him to fend for himself with a temporary (and rather unhinged) valet, Brinkley. Lacking Jeeves, Wooster gets into considerable scrapes and misunderstandings, culminating in him sleeping in hedges, potting sheds and garages, provoking the local constabulary and risking his friendship with Chuffy. He is even imprisoned aboard a luxury yacht in an attempt to force him to marry Pauline Stoker. All comes right in the end. With a face blackened by boot polish so that he could escape the yacht disguised as a wandering minstrel, Wooster, with considerable help from intervention by Jeeves, manages to communicate so that all wronged parties are soothed and pacified. A jolly set of scrapes, but a bit gung-ho for me! 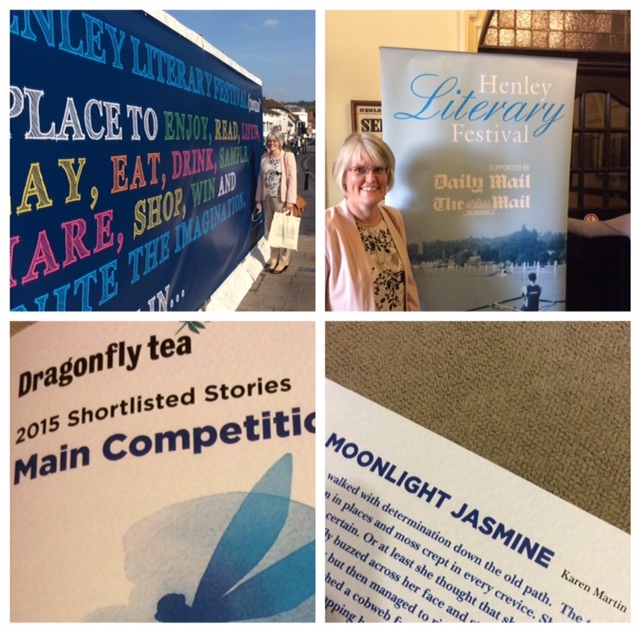 Far more to my taste was the time spent at the Henley Literary Festival last weekend. Regular readers will know that I mourned my session with Patrick Gale earlier in the week, missed due to illness, but I had recovered enough by Sunday to mosey on over to the final day of the festival. Lovely hubby decided he could face putting his literary toe in the water and he accompanied me to a talk by Mary Chamberlain about her novel The Dressmaker of Dachau and Michael Holroyd who was talking about his novel A Dog's Life. This was a really civilised and interesting way to spend an hour, and needless to say, I left the session with two new books! Mary Chamberlain has spent many years in historical publishing, but this is her first novel. Softly spoken, intelligent, articulate and bubbling with enthusiasm for her fictional foray, she was an inspiration. Her reading of her own work was beautifully executed and I am anticipating a very good read. Michael Holyroyd was also entertaining, his wry humour permeated the session and is a key focus in his novel. Interesting is the story behind his fiction; his novel was written in the 1950's, but not published in the UK because his father objected to the comedy created from his own domestic situation. 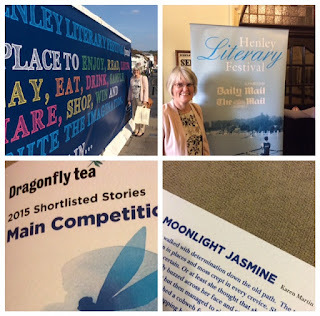 But the highlight of the festival for me was the Dragonfly Tea Short Story award. As I mentioned in my previous blog, I was delighted to be shortlisted, and felt like a winner already....but that was nothing compared to being announced as the actual winner! Helen Lederer was presenting the prizes and as she described the winning entry, my knees started to wobble.... When my name popped up on the screen, I somehow managed to get up and walk across the stage to be greeted by Helen and receive my prize. How I made it back to my seat without my jelly legs giving way, I'll never know! And as a post script...I may have missed Patrick Gale, but I did manage to snaffle one of two remaining signed copies of his latest book, A Place Called Winter from the cute, independent The Bell Bookshop in Henley. Maybe I should use some of my winnings to see him at his next literary event!